I've written a guest post on bullying in SL over at Nordanomjorden's Blog. Pass on the URL if you agree with what I've written. UPDATE 19 Jan 2013. Flora appears to have deleted the Nordan Art blog and all its content. Fortunately, I managed to grab a cached version of the page and copy across the article, which you can now read below. Ah, Second Life: the place where colour means nothing. The place where status means nothing. The place where gender identity and sexuality mean nothing – nothing at all! The place where people can just get along. I suspect you can see where this one’s going. 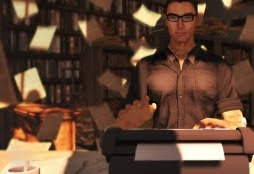 Generally speaking, the understanding of the immense possibility offered by Second Life for human interaction comes along – if at all – after the realisation that it’s yet another place for people to behave like dicks in. It’s no different from any other place on the planet. Well, why should it be? In fact, it’s worse. Anonymity plays a key role in this, which is topical, given the recent hoo-haa concerning the banning of Google+ accounts where false names are used. I happen to be strongly in favour of pseudonyms on the internet (all the reasons for which can be found at http://my.nameis.me), but the price we pay for this is the occasional abuse of that extra layer of separation between behaviour and consequence. Anyone who has reason to moderate their behaviour in the real world (that pretty much includes all of us) can find on the internet the freedom to step outside of this ‘constraint’ if they choose to do so. One of the prices of anonymity is bullying. Although it’s not quite anonymity, is it? Calling it that, in fact, rather misses one of the most important points about bullying, which is that it almost always requires an audience of some description. The bully wants to be seen because the bully wants to impress. The bully does actually want people to say, “That’s the work of so-and-so. Aren’t they impressive?” A truly anonymous action would involve something done by someone no-one had ever heard of before, and with no secret clues so that the intended audience could nudge and wink at the tell-tale footprints. It occurs to me that what most people think of as individual griefing – the newbie at an info-hub who walks around naked and tells everyone to get a life, for example – is anonymous in this respect; bullying isn’t. Bullying and griefing in SL, then, are distinct: griefing is targeted at wide groups of people who usually have no idea who the griefer is; bullying, on the other hand, is targeted at specific individuals, and victims and audience alike know exactly who the perpetrator is (though not enough for there to be any real life consequences). Both are forms of abuse, but griefing is far more easily endured, since victims are rarely alone in their experience. Griefing is not so personal. I’ve recently had reason to think quite a bit about bullying in SL, not least because I fell susceptible myself to one of the rationalisation traps that can actually perpetuate bullying behaviour. More about that later. My RL occupation brings me into regular contact with schools and colleges, in which – so the media would have us believe – bullying is born and bred. (It isn’t, by the way: the capacity to bully is something we’re all created with and schools are just the first social context we encounter where it can serve a purpose. Genetically, it stems from the period when we lived in tribes and our safety depended on belonging: making someone else the target for ridicule makes it less likely we’ll be picked on ourselves. And belonging, incidentally, is not the same as being liked, which has been known for decades: Maslow’s famous ‘hierarchy of need,’ for example, places the need to belong below the need to be liked and above the need for security; bullies, then – contrary to the popular adage – don’t necessarily ‘just want to be liked’). The vast majority of bullying in schools – about 80% of it – is still non-electronic. The intense interest in cyber-bullying, then, comes not from its overall frequency, but from the fact that its impact has been found by research to be more damaging than ‘conventional’ bullying. Why might this be? In the first place, the audience is larger. Rather than just being restricted to a locally known group of people, online bullying is witnessed potentially by an international audience. It opens up the possibility that new, previously unknown people, can join in with the pointing and the jeering, and that comments made by them can feed back on and influence the people that we do know. Second, there is no escape. No longer can we get away from bullying simply by going home and no longer is there is there any time of day in which bullying can’t occur. Third, electronic media makes it more easy to distribute highly personal details about a victim, such as the contents of a private conversation or a humiliating image or video. Fourth, the issue of anonymity from sanctions. The intended audience might know who ‘Bronson_889′ is, but there’s no official link to the guy who lives at number 53 without some serious police work. What, then, constitutes cyber-bullying? A recent definition gives it as this: “electronically mediated behaviours among peers such as making fun of, telling lies, spreading rumours, threats and sharing private information or pictures without permission to do so.” In the case of SL, peers can be taken to mean community members, whatever particular community that may be. There are of course thousands of them, but I’m going to concentrate here on the art community and for two reasons. First of all, it’s where I’ve most recently witnessed cyber-bullying, but the main reason is that there appears to be a belief amongst some art community members that this sort of behaviour doesn’t actually constitute bullying at all, but instead some sort of clever artistic expression. Turning up at and disrupting someone’s art event, they say, isn’t bullying, it’s protest against ‘bad art’ – it’s ‘livening up a dull event,’ in fact. Targeting insults towards people in public chat, they say – isn’t bullying, it’s clever wit (we’re not talking about comedy genius here, by the way, but comments that struggle to achieve even the sophistication of teenage jeers, like, “you’re so boring.”) Repeatedly hitting someone in front of others with a stick and following them wherever they go isn’t bullying. Publishing private IMs on a public blog isn’t bullying. It’s art. It’s all just art. Art – in my opinion – is more a subjective experience than an objective one. Aesthetic pleasure varies from person to person, depending on their preferences and perception, and its experience may indeed be encountered in scenes that others find distasteful. But experiencing something as artistic does not make it not bullying. And it is not a justification for that act. What was the trap I fell into? For all the insights into bullying I thought I had, I fell for the old ‘he/she invites the bullying’ rationalization. The problem with anti-bullying campaigns (see, for example, the ‘Let’s beat it together’ cyber-bullying video on YouTube) is that they often present bully victims as perfect people that it’s impossible to imagine did anything to merit them becoming a target. The reality is far messier than that. Bully victims don’t necessarily just take their victimisation quietly. They sometimes lash back. They sometimes kick and punch. They sometimes scream in frustration. Sometimes, it is the expression of a personal belief or the absence of a social skill that leads to people being targeted, but the expression of a belief – however much we disagree with it – is not bullying; rudeness – in and of itself – is not bullying: it is the acting on or employment of these things over time – towards a target and in front of an audience – that makes it bullying. It becomes bullying when it’s something that’s strategically done for personal gain (if I victimise this person, others will be impressed by me) rather than something that spontaneously arises. I’m not saying we shouldn’t challenge beliefs we don’t agree with, just that bullying is not the way to do it. So, because I saw actions that I felt were just encouraging the bullying, I sat back and labelled the whole thing drama and missed the point entirely that one side were using the tactics of naming, mocking and humiliating whilst the other was effectively shouting out, “For God’s sake, stop doing this to us.” I became a bystander. And bystanders are the people who research have shown to be the true perpetrators of bullying. The people who watch. The people who endorse. The people who don’t intervene. Is it art? Maybe. But it might well be bullying too. If we really want SL to become the human utopia that it could be, we have to learn to recognise bullying for what it is instead of rationalizing it as something else in order to justify our non-involvement or – worse – participation. Next time you see this behaviour in SL, challenge it. You don’t have to come up with something witty or abusive, you don’t necessarily have to affiliate yourself with the victim if their beliefs conflict with yours: just say that you don’t like this behaviour and tell people you see endorsing the bully that you don’t like that either. Bullying needs an appreciative audience: don’t allow yourself to become part of it.